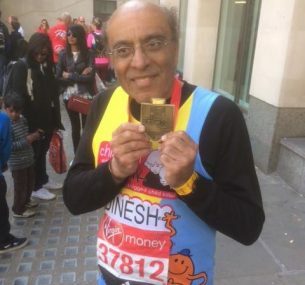 Dinesh ran his first Virgin London Marathon in April 2017 and finishing in a good time of 4 hours 58 minutes. He came 388th from 578 runners in his age group. 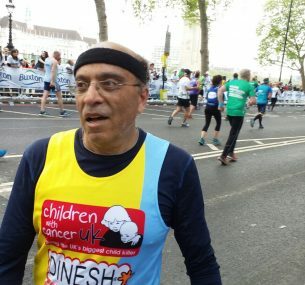 What an experience – 40,000 runners, a record number. 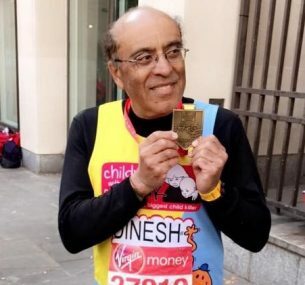 London one is the world’s greatest, so I have been told by experienced marathon runners. There were trials and tribulations along the way. The crowd was electric and cheered you on and fed you with sweets. Children, lined along the route, wanting to do high fives with you and handed out jelly babies to runners. The crowd encouraged and shouted your name when you were ready to give up, in agony and at the point of despair. My family and friends were really needed when it mattered most. Just the sight of them uplifted my flagging spirit. The first 13 miles was great, good pace easily staying with the 4:30 pacemaker, relaxed and happy, energised by seeing my family and friends at this marker. Hey, this is easy I thought – boy was I wrong! Then tiredness started after 21 miles rather than sipping water. I was downing whole bottles every mile – something was not right. I was not hydrating properly; I urgently needed salt intake but could not drink Lucozade, which made me feel ill as I was not training with this drink. I was also getting severe stomach cramps that would not go away, but I knew if I stopped I would not be able to start again and remembered the ill children for the charity I was running, knowing my pain paled into insignificance against their suffering, and this spurred me on. 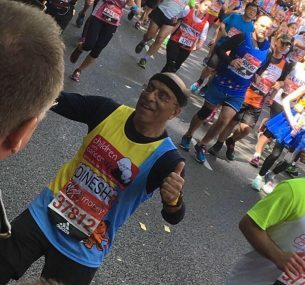 I pressed on and at 25 miles I was in agony with cramp and exhaustion; just when I needed it most I saw my family and friends and staggered towards them with high fives. So close yet so far! The last mile was the worst, the crowd was amazing but physically I was gone. Running on pure determination, in a daze and ignoring the pain. I saw the last 1km marker and gritted my teeth telling myself it is not far now but the short distance felt like ages. The 400m marker passed and I had a burst of speed from somewhere, passing the finishing line completely exhausted. Walking along The Mall, elated with my medal around my neck. I stopped to do my stretches. That’s when the pain hit me, I tried stretching but it was useless, my right arm was limp with pain and could not lift it at all. My right foot was aching, pulled off my sock and noticed half my toe nail had ripped off. I sought some medical attention and hobbled to my friends at Admiralty Arch. Some experienced marathon runners helped me recover with some special stretches. I was so happy they were there. I had trained hard for my charity and I was elated that I finished in 4 hours 58 minutes, which was much longer than I anticipated in training but hey this was my first. I came 388th from overall 578 runners in my age group. Would I do it again – oh absolutely yes! It will not be my last. I am really proud of all my sponsors; you have raised an amazing amount that will go to Children with Cancer UK. I am so lucky to have so many friends and colleagues who care. Give yourself a pat on the back and drinks on me when we next meet.